Predator guards are a necessary part of your nest box project. A wide variety of predators will be happy to eat your eggs, nestlings, and/or adult birds, so having a predator guard is critical to greatly reducing the chances of nest predation. No predator guard is 100% effective, but guards significantly reduce predation at the nest. To reduce nest predation, NEVER place a box on a tree, fence post or other structure where you cannot attach a predator guard. The most effective guard is a simple guard made of a 24" long piece of aluminum stovepipe (8" diameter). This will help guard against snakes, raccoons, cats, squirrels, mice, rats and other climbing predators as long as they cannot jump to the box from nearby trees, branches, and shrubs. The slicker the stovepipe the better! Conical baffles are fairly easy to make and are good for nest boxes mounted on wooden posts. If the cone is large enough, they can deter most predators. We recommend mounting nest boxes on metal electrical conduit pipe or metal highway signs (see species pages) using 1/2" electrical conduit for light boxes or ¾ - 1" for heavier boxes. Some folks regularly use lithium-based automotive grease on metal conduit poles to also make it harder for critters to climb a pole with no guard. •	Use of a "Bird Guardian" (a commercially available plastic tube inserted into the entrance hole or screwed onto the box exterior) provides protection against predators, but not snakes. It also makes feeding more difficult and is generally not well accepted by bluebirds. Bluebird box monitors have found that few, if any, bluebirds will use a box with a Bird Guardian on it, and some even abandon nests with eggs when a Bird Guardian is placed on a box. •	A thick hardware block placed over the entrance hole does NOT deter raccoons (or snakes). It may make it more difficult for avian predators to reach eggs. •	Two short perches right under the entrance hole inside the box do NOT protect eggs or nestlings from cats or birds. •	Suggestions like wrapping a pole in barbed wire, putting carpet tack strips, razor blades or fish hooks on poles don't work well, are dangerous to humans including children, and are not considered humane. 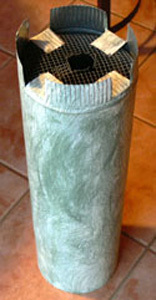 •	Galvanized stove or vent/duct pipe. We recommend using 8" diameter (wider is better) x 24" long. Both can be purchased at Big Box home improvement stores, usually in the plumbing section near heat registers and furnace filters. Use only galvanized stove pipe as a black matte finish will probably rust. We don't recommend the kind with rivets (unless they are blind/pop rivets). We suggest using stove pipe with a straight, vertical seam or snap together pipes. •	Circle of ½ inch hardware cloth that is 1" bigger than the stove pipe. Hardware cloth is flexible wire mesh available in hardware and garden stores. Instructions: Put the baffle on BEFORE you put the nest box on. 1. Use tin snips (offset are best) to cut a hardware cloth circle that is 1" bigger all around than the stovepipe. 3. Put the hardware cloth circle over the top of the stovepipe. Then bend the edges down one inch all around so it fits tightly INSIDE the stovepipe. 4. Use tin snips to cut three tabs in the top of the stovepipe. Bend these tabs over the hardware cloth. 5. Bolt the two strips of hanger iron (or a hose clamp) securely on either side of the mounting pipe, and bend them to support the hardware cloth. Duct tape wrapped around the pole helps hold the hanger iron in place. 6. Double check that there are no gaps that would allow snakes to squeeze through. You can take a slotted screwdriver and use it to pry the hardware cloth up against the stovepipe sides. 7. Slip the assembled baffle over the pole until it rests on the hanger iron bracket. The top of the baffle needs to be at least four feet off the ground. The baffle should wobble a little to discourage climbing predators. Information and photos for this page were used with permission from Bet Zimmerman, the North American Bluebird Society, and Ron Kingston.